When I was young, other than teacher, I also wanted to be a plants biologist. My love for plants, compared to animals, is because plants do not run around. I have introduced my brave little cactus to you, and now I would like to introduce you to my mini garden. The formal name of a mini garden is terrarium, which is an enclosed glass container, in which plants and small land animals are kept and observed. Mini garden is the more “romantic” name if you are only having plants inside the terrarium. The mini garden is low maintenance. It is using the water cycle concept to keep the garden alive. It has its own self-sufficient ecosystem. The air, nutrients and water are recycled inside the container. The only outside energy that it needs is the light energy for photosynthesis. Though around 75% of the Earth is covered by water, that’s all the water we have. The water is going through water cycle again and again and again… so that the water is recycled and will not get lesser. When the sun heats up the water in lakes, rivers and/or the ocean, the water turns into vapour and goes into the air (the sky). In the mini garden, the plants transpire. That means the plants go through transpiration to get water vapour back into the air. Condensation is the process of the water vapour in the air gets cold and changes back into liquid to form clouds. The water vapour that you see on the glass container is the proof of condensation. When the water from plants transpiration touches the cold glass, it turns back into liquid. When more and more water is accumulated, the clouds get heavy and water falls back to the Earth. Similarly in the mini garden, the water vapour on the glass container is used for respiration and collection. The water from the clouds (generally as rain) falls back in lakes, rivers and/or the ocean, some falls on land and is used by animals and plants. 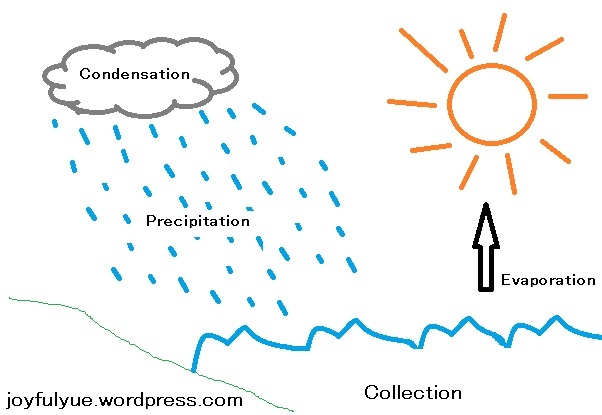 The cycle repeats again with evaporation and transpiration. The water is collected at the bottom of the glass container in the mini garden. As long as the water cycle repeats, the plants have sufficient water to grow and thus you no need to water the plants frequently. Thus, when you see the water vapour on the glass container, do not be alarmed, it is a sign of the water cycle keeps repeating itself. By Wendy in Life and Science on 09/10/2013 .